The fast-paced developed of any technology and incorporating them into teaching methods and approaches can help in enhancing the learning experience for students. Learning has evolved over the centuries and augmented reality in education is the next stage of evolution in education. Augmented reality is an off-shoot of the virtual reality technology. It can be referred to as creating or initiating artificial stimuli using a wide array of multisensory tools and technologies. It creates a form of a voluntary illusion which is used to refine the visual senses. Augmented reality can include a wide array of information such as local surroundings of a particular site etc. These features of augmented reality offer an implementation of augmented reality in education and teaching methods. With the development of a wide array of augmented reality apps for education, advancements in the field of augmented reality and computing technologies is forcing school administrations to introduce augmented reality in education. Teachers have begun using augmented reality technologies in the classrooms. Using features of augmented reality in education, educators can enhance the learning interest of students, help them learn better and motivate them to study further. Instead of teaching about a place, students can walk through the streets of these places. Students can learn history by visualising historical events using AR. Students can learn scientific facts by observing it in action rather than simply reading books. The possibilities of augmented reality in education are endless. In spite of advancements in the field of education and teaching techniques, none of the previous advancements has been able to generate any form of interest and curiosity within students. Teaching has long remained classroom lectures and reading book. But, incorporating augmented reality in education can be a game changer. With students being able to see and feel their lessons, can making boring lessons fun. Seeing their lessons in an AR environment can make the process of learning, easier and much more fun for the students. Augmented reality in education can provide students with a highly interactive learning experience by bringing lessons to life. Using augmented reality apps for education, students can communicate with any form on virtual content with complete freedom, which is not possible in textbook learning. For instance, a biology student can have a virtual tour of the human anatomy and learn about the functioning of the human body in a much immersive method rather than simply reading books. 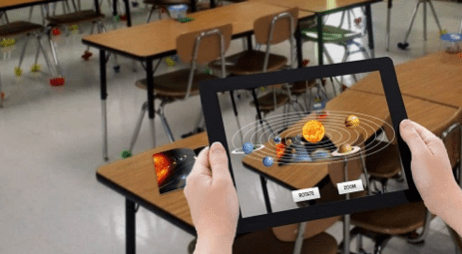 Augmented reality apps for education and other features of Augmented reality in education can offer students a learning experience which stimulates their senses. Students can learn using 3-D models offering a 360-degree view from every angle rather than a static image. Students can also learn using sound and touch control, as a result of this, offering students multi-sensory learning experience. This enables better learning, makes the process of learning fun and more importantly, engages the students and makes them eager to learn. Augmented reality in education can help students to clarify difficult concepts with the aid of different features of augmented reality such as augmented reality apps for education, 3D modelling etc. Certain concepts might be difficult to understand in a classroom situation, can be easily explained through visual learning. Augmented Reality can merge hypothetical situations with actual educational concepts to provide an effective and easy learning experience for the students. Augmented reality in education can be effectively and efficiently integrated to provide enhanced teaching and learning experience. Augmented reality apps for education can make learning fun, awakening their curiosity and make them eager for their next lesson rather than dread it. Education is an important part of a person’s life and augmented reality in education has the potential of making this phase of life into one of the most exciting ones as well. Guest article written by: The director of Zeal 3D Printing, Kiran H. is the author of this article. He is offering Augmented Reality Service for the last some time. He has earned good success in the AR industry as well as in 3d printing industry for his unique and custom designs for his clients.